Ocala, Fla. – Four USEF Combined Driving National Championships came to a close at Live Oak International on Sunday with the cones phase determining the national titles. Tracey Morgan, Katie Whaley, Steve Wilson, and Chester Weber, the leaders following Saturday’s marathon phase, held on to their leads to claim top honors in respective divisions. Morgan (Beallsville, Md.) 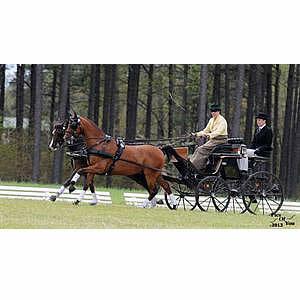 and Fuego 88 won all three phases to win the USEF Single Pony Combined Driving National Championship. The duo had an excellent dressage test with great one-handed movements and quality canter work to win the dressage phase with a score of 48.54. Morgan and her own 2011 German Riding Pony gelding blazed around the marathon course, collecting 89.59 penalties and having the fastest times at obstacles two and five for the division. They had a winning cones performance, adding only a 0.43 time penalty to their overall score of 138.56. Rebecca Gutierrez (Windsor, S.C.) and Naria BW6 had a solid dressage test to score 57.39 to sit in third place after the first day of competition. They followed that up with an equally good marathon performance to finish second in the phase, tallying 90.50 penalties and having the fastest time at obstacle six. Gutierrez and Richard Olson’s 2003 Haflinger mare had one ball down in the cones phase at cone seven for three course penalties and a 0.10 time penalty to finish third in the phase and clinch the Reserve Champion title with an overall score of 150.99. Barbara Chapman (Metamora, Mich.) and Darlene Daly’s Maduro performed an obedient dressage test with good diagonal yields and deviations to score 56.54 to put them in second place on Thursday. They were third in the marathon phase with 95.36 penalties and had the fastest time at obstacle three. Chapman and the 2008 North American Sportpony gelding had a solid cones round with an unlucky ball down at cone 20 and 2.79 time penalties. They held on to finish in third place with an overall score of 157.69. Defending-champion Whaley (Paris, Ky.) led from start to finish to claim her second consecutive USEF Pair Pony Combined Driving National Championship title. She had a great dressage test with her own and Barbara Sims’ Welsh geldings, highlighted by wonderful extended trot work, to win the phase with a score of 49.79. Whaley and her ponies had a winning marathon performance, collecting 91.04 penalties and having the fastest times in six of the seven obstacles. She had a fast, double-clear round to win the cones phase to clinch top honors with an overall score of 140.83. Jennifer Matheson (Aiken, S.C.) and Katrina Becker and Carina Crawford’s mixed pair had a respectable dressage test to finish third in the phase with a score of 63.06. They had some bobbles in the marathon phase, garnering 180.93 penalties, but had the fastest time at obstacle six. Matheson and her ponies finished strong, going double-clear in the cones phase to finish second in the phase and earn the Reserve Champion title with an overall score of 166.49. Mary Phelps (Columbia, Ky.) had a smooth dressage test with her own American Shetland Pony pair to finish second in the phase with a score of 62.65. They were bold out on the marathon course, finishing second in the phase with 96.36 penalties. Phelps had four balls down with her ponies in the cones phase for 12 course penalties, finishing third in both the cones phase and the overall standings with a score of 171.01. Defending-champion Wilson (Louisville, Ky.) and his own mixed KWPN and Lipizzaner pair had a smooth dressage test to finish second in the phase with a score of 55.04. They had a stellar marathon performance to win the phase, tallying 103.62 penalties and having the fastest times in six of the seven obstacles. Wilson and his pair finished second in the cones phase with six course penalties for two balls down and 2.79 time penalties, allowing them to earn their third consecutive USEF Pair Horse Combined Driving National Championship with an overall score of 167.33. Josh Rector (Dyke, Va.) and his, Jessica Buchanan, and Rainier Tanglao’s mixed pair had a workmanlike dressage test to score 70.26, finishing third in the phase. They finished second in the marathon with 106.00 and had the fastest time in obstacle three. Rector and his pair went double-clear in the cones phase to win the phase and earn Reserve Champion honors with an overall score of 176.26. James Miller (Paris, Ky.) and wife Misdee Wrigley Miller’s Dutch Warmblood geldings had a lovely dressage test in his national championship debut, earning a score of 48.90 to win the phase. They had a respectable marathon performance, finishing third in the phase with 120.52 penalties. Miller and his pair had three balls down and 1.34 time penalties to finish third in the cones phase and third in the overall standings with a score of 182.76. Defending-champion Weber (Ocala, Fla.) demonstrated great style with his team, which contained new horses, to claim his 14th USEF Four-in-Hand Horse Combined Driving National Championship. He had an excellent dressage test with his, Jane Clark, and Fritz Grupe’s Dutch Warmblood geldings. They showed great harmony and performed lovely movements to score 36.51 to win the phase. They won the marathon phase with 112.96 penalties and had the fastest times in all of the obstacles. Weber and his team had one ball down at cone 18 and 2.23 time penalties to finish second in the cones phase with an overall score of 154.70. Misdee Wrigley Miller (Paris, Ky.) had strong performances throughout the competition on her way to earning the Reserve Champion title. She had a beautiful dressage test with her own Dutch Warmblood geldings to finish second in the phase with a score of 41.47. On marathon day, Wrigley Miller had a bobble at obstacle six, but finished strongly with 134.88 penalties to finish second once again. She and her team had two balls down at the B and D elements of cone six and 5.24 time penalties to finish third in the phase. They held on to earn the Reserve Champion title with an overall score of 187.59. Allison Stroud (West Grove, Pa.) and Willow Star LLC’s Dutch Warmblood geldings had a great dressage test to score 51.79. They had some trouble in obstacle six and totaled 146.04 penalties in the marathon phase. Stroud and her team ended the competition on a high note by winning the cones phase with only 3.81 time penalties and finishing with an overall score of 201.64. Breda, Netherlands – Tracey Morgan wrapped up a successful showing at the Singles Pony World Driving Championship Sunday with an eighth place finish in the cones phase. Morgan and her own Fuego 88 will leave Breda with a 19th place finish and score of 180.6 overall behind the 2015 World Single Pony Champion Fabian Gänshirt of Germany and World Single Pony Reserve Champion, Martin Hölle of Hungary. Gänshirt earned an overall score of 156.88 and Hölle finished with a total score of 157.55. “I’m pleased, but I would have liked to have done better. The competition was outstanding and there were a lot of new drivers on the scene. This is the second time driving Fuego 88 in these world championships. He is a wonderful competitor. I’m looking forward to next year and defending our national championship title as well as helping to bring along new talent through the USEF Developing Drivers Program so we can compete on a team level,” said Morgan. On Thursday, Morgan and Fuego 88 began the competition with a solid dressage test despite the extraordinary amount of mud and rain. The unpleasant conditions made it difficult for Fuego 88 to gain his footing; however, the team muscled through to earn a score of 47.49, good for eighth place. The judges had high standards as only 13 of the 32 teams scored under 50. Morgan struggled during Saturday’s marathon phase. Unfavorable weather continued which made the course unmanageable for many drivers. Tight turns were especially hard to maneuver in the tough terrain. They finished in 24th place with a score of 130.88. Morgan came into Sunday’s cone competition in 22nd place overall with a score of 178.37. Morgan drove Fuego 88 beautifully, even though the weather did not cooperate. They were one of nine teams who kept all the balls up, but they added 1.69 in time penalties. Five drivers completed the course perfectly. Breda, Netherlands – Accomplished pony driver Tracey Morgan (Beallsville, Md.) will represent the United States this week at the 2015 FEI World Driving Championships for Ponies. The championships will take place during Outdoor Brabant at the beautiful Prinsenhoeve Estate in Breda, The Netherlands, September 2-6, featuring 88 drivers from 16 nations competing across three divisions: single, pair, and pony team. Morgan will drive her own trusted partner, German Riding Pony, Fuego 88, in the single pony division. 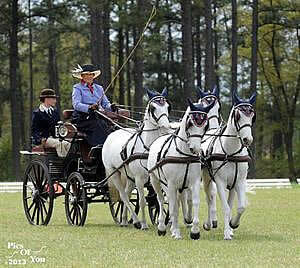 They join a field of 32 drivers all vying for the chance to be named Singles Pony Driving World Champion. Morgan is no stranger to these championships having helped the U.S. team win Bronze in 2007 and competing in the 2009 and 2013 championships. That experience will help as she faces tough competition from returning Single Ponies Champion Martin Hölle of Hungary. However, she and Fuego 88 come into the 2015 FEI World Driving Championships for Ponies following stellar performances in national and international competitions. In July, the combination finished third in the National Single Pony division at CAI3* Beekbergen. They reclaimed the USEF Combined Driving Single Pony National Championship and also won the CAI2*-P1 division at the Live Oak International in March. Earlier in the year, they took first in the CAI2*-P1 division at the Kingdom of the Sun CDE. The 2015 FEI World Driving Championships for Ponies will begin on Thursday with the dressage phase. On Saturday, drivers will test their ponies’ endurance during the marathon phase. The championships conclude on Sunday with the cones phase. Visit Outdoor Brabant for more information on the 2015 FEI World Driving Championships for Ponies, including day-to-day schedules, starting lists, score updates, and results. Pau, France – At the conclusion of the first phase of the 2013 FEI Pony World Driving Championships, the United States stands in sixth place on a total of 158.60. On Friday, the Single Pony competitors went to task before the Ground Jury of Klaus Christ, Anne-Marie Turbe, Diana Brownlie, and Dot Wilcoxson. On the second day of the driven dressage the United Sates was represented by Tracey Morgan and Paul Maye. Morgan (Beallsville, Md.) drove her own Fuego 88 to a top-10 placing in the Single Pony Championship on a score of 48.77.The 2013 USEF National Combined Driving Single Pony Champion looks to climb the leaderboard on Saturday’s marathon when she sets off in eighth place. Maye (Fairfield, Va.) and Harmony Sporthorses’ Markus earned a score of 59.39 and will head onto the marathon in 19th place. Els Broekman of The Netherlands leads the Single Pony Championship on a score of 36.67, Hungary’s Martin Holle stands second on a score of 43.01, while Germany’s Jacqueline Walter is third on a score of 43.20. In the Team standings, The Netherlands heads onto the marathon as the early leaders on a score of 107.26, Germany stands second on a score of 122.31 and Hungary lies third on a score of 152.39. 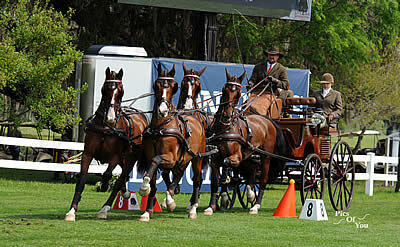 To learn more about the 2013 FEI Pony World Driving Championships, visit: http://www.couleurs-automne.com/en/welcome.